When eleven-year-old Stella Rodriguez shows up at NASA to request that her recording be included in Carl Sagan’s Golden Record, something unexpected happens: A black hole follows her home, and sets out to live in her house as a pet. The black hole swallows everything he touches, which is challenging to say the least—but also turns out to be a convenient way to get rid of those items that Stella doesn’t want around. Soon the ugly sweaters her aunt has made for her all disappear within the black hole, as does the smelly class hamster she’s taking care of, and most important, all the reminders of her dead father that are just too painful to have around. It’s not until Stella, her younger brother, Cosmo, the family puppy, and even the bathroom tub all get swallowed up by the black hole that Stella comes to realize she has been letting her own grief consume her. And that’s not the only thing she realizes as she attempts to get back home. This is an astonishingly original and funny adventure with a great big heart. I received this book for free from Penguin for review consideration. This does not affect my opinion of the book or the content of my review. The Care and Feeding of A Black Hole isn’t about anti-gravity, but it is a book that you won’t be able to put down. On Day One, twelve-year-old Malu (Maria Luisa, if you want to annoy her) inadvertently upsets Posada Middle School’s queen bee, violates the school’s dress code with her punk rock look, and disappoints her college-professor mom in the process. Her dad, who now lives a thousand miles away, says things will get better as long as she remembers the first rule of punk: be yourself. The First Rule of Punk hits every note with a perfectly pitched scream. Malu—don’t call her Maria Luisa—is into two things: punk music + zines. When her mother moves them to Florida, she finds herself doing things she never thought she would back home: making friends in her new home and getting in touch with her Mexican heritage. It’s certainly not any book your Abuela has encountered. Get your cape on with the DC Super Hero Girls™— the unprecedented new Super Hero universe especially for girls! Readers of all ages can fly high with the all-new adventures of Wonder Woman™, Supergirl™, Batgirl™, and some of the world’s most iconic female super heroes as high schoolers! Welcome to the fourth Super Hero High blog tour!! That’s right! Random House has published Katana’s story in the series, and it is amazing and adorable. I received this book for free from Random House for review consideration. This does not affect my opinion of the book or the content of my review. Katana’s story unfolds with a message from conch shell. Right at the start, Katana goes missing, after she was supposed to bring back a celebration cake for Batgirl, and the Supers go on a search to find their friend. Katana is found in the hidden underground tunnels at Super Hero High with Samurai sword surrounding her like a protection seal. Since that moment, she tries to figure out what she’s meant to do with these swords, how she’s meant to protect her friends and family, and what happened to her grandmother who went missing years ago. Things Mischa “Ish” Love will miss when she goes to Mars: lying on the living room floor watching TV, ice cream, her parrot Buzz Aldrin. Things Ish Love will not miss when she goes to Mars: mosquitoes, heat waves, missing her former best friend Tig. Ish is convinced that she’ll be one of the first settlers on Mars. She’s applied to—and been rejected from—the Mars Now project forty-seven times, but the mission won’t leave for ten years and Ish hasn’t given up hope. She also hasn’t given up hope that Tig will be her best friend again (not that she’d ever admit that to anyone, least of all herself). When Ish collapses on the first day of seventh grade, she gets a diagnosis that threatens all her future plans. As Ish fights cancer, she dreams in vivid detail about the Martian adventures she’s always known she’d have—and makes unexpected discoveries about love, fate, and her place in the vast universe. All Mischa “Ish” Love has ever thought about is going to Mars. Sure, she’s gonna miss her family and her parrot Buzz Aldrin, but it’s Mars! Ish and her best friend, Tig, have discussed this Mars dream for years; she’s applied to the Mars Now project and rejected so many times she can’t count it on her hands. Despite the rejections and people’s non-believing reactions to her Mars dream, she’s not gonna give up. Ish will go to Mars. But what happens when an unexpected diagnosis throws a wrench in her future plans? Batgirl has always hidden in the shadows—but does she have what it takes to stand in the spotlight at Super Hero High? Barbara Gordon has always been an off-the-charts, just-forget-about-the-test super-genius and tech whiz, and then she gets the offer of a lifetime when Supergirl recognizes that Barbara’s talents make her an ideal candidate for Super Hero High. Donning the cape and cowl, Barbara Gordon becomes Batgirl, ready to train at the most elite school on the planet, next to some of the most powerful teenagers in the galaxy. She’s always had the heart of a hero . . . but now she’ll have to prove that she can be one. Good thing she loves a challenge! 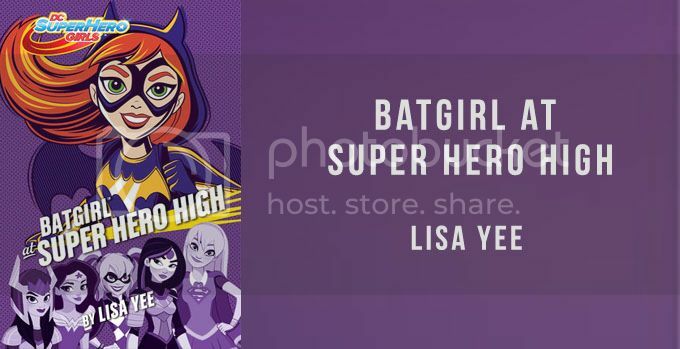 Did I screech in excitement when I heard Batgirl was getting her own Super Hero High book? You bet I did. Did I refrain from scaring the Random House publicist when she asked if I want to take part in the Batgirl at Super Hero High blog tour? Yup. Na na na na na na na na Batgirl! Batgirl! In this third book in the Super Hero High series, Batgirl has decided that she doesn’t want to sit on the sidelines anymore while her friends are out there saving people. She wants to attend Super Hero High, but her dad, Commissioner Gordon, absolutely refuses to allow her. With her superior reasoning skills, she manages to convince her reluctant dad to let her attend the school (but with a few set of rules she must abide by). In Batgirl at Super Hero High, Batgirl has to deal with her desire to save people like her dad, a worried dad who doesn’t want Batgirl to get hurt, stress from all the different work loads she’s juggling, a reality show about technologically savvy people, and much more!